Secure file management in the Bring Your Own Device (BYOD) workplace is now possible with the GoAnywhere File Transfer mobile app. This app enables users of Apple and Android devices to easily and securely send ad hoc file transfers with GoAnywhere MFT. GoAnywhere File Transfer delivers a mobility tool that makes it easier for workers to connect with corporate documents. This improves adoption rates and reduces reliance on policy enforcement to control data security. 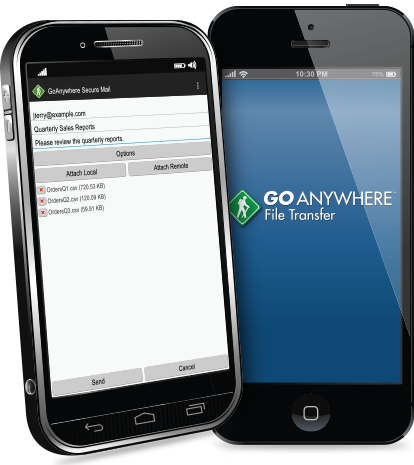 GoAnywhere File Transfer mobile app is free to customers with the HTTPS Server in GoAnywhere MFT. 1Currently available only on Android smart phones and tablets.